Today, we are working on the artwork portion of the lapbooks. Little Miss finished making a series of mini books and painted a watercolor picture of the earth. Her Oklahoma notebook is still a work in progress, but she is nearing the end of that one also. The autumn unit will be the last to be completed. She has a few more mini books to make. I have to admit that I am part of the delay. One of the mini books that she is making is being done in the shape of a large maple leaf and another is the shape of an oak leaf. I have a large cookie cutter of each that is being used as the pattern for these. We don’t have autumn print paper, so she is going to do a watercolor wash of autumn colors on art paper to use as the covers & pages for her books. I am finding with Pookie that he loves to be read to. Grab a book and sit on the couch and you quickly have Pookie curled up against you waiting to hear the story. I don’t mind. I love reading to the kids. I am finding that the 3 hours I spend each day reading to them is a favorite time of each day. We read 2 or 2.5 hours in the morning, then for another half hour before tucking the kids into bed at night. People are always talking about the idea that those with autism seem to have one area that they are extremely interested in or focus on. At this time, Pookie seems to love anything to do with painting. Watercolors or tempera paints, it doesn’t matter. He loves using them. I think I will go broke keeping him in painting supplies. LOL It is the one activity, outside of being read to, that is guaranteed to hold his interest and enjoyment. Seeing the enjoyment both kids have with watercolors, I am going to let them make a bunch of watercolor wash backgrounds for us to use to make the holiday cards we send out this year. Autumn colors for the Thanksgiving cards and wintery colors for Christmas. I want to come up with a meaningful way to let them participate in the making of the cards. This seems to be one way to do it. 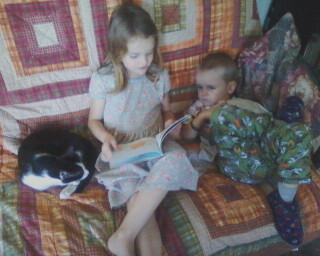 A beautiful moment today was when Little Miss sat on the couch and read a book to Pookie. It is such a sweet time that deeply touched this Momma’s heart. Very precious. I’m glad you got a picture of it.